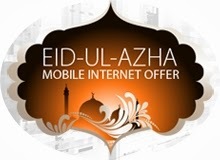 Ufone is offering free mobile internet on Eid-ul-Azha Day i.e October 16, 2013. On the first day of this Eid-ul-Azha, Ufone customers can use free mobile Internet as part of a special Ufone promotion. The offer is valid only for the first day of Eid and fair Usage Policy of 50MB applies on Ufone Eid-ul-Azha Mobile internet Offer. How to avail free mobile internet ? Dial *3434# from your Ufone connection and enjoy free mobile Internet on Eid. Fair Usage Policy of 50MB applies. Standard rates apply after the consumption of free volume. This offer is for all Ufone prepaid customers.